AR12192: Biggest Sunspot of Two Solar Cycles! - The Sun Today with C. Alex Young, Ph.D.
AR12192: Biggest Sunspot of Two Solar Cycles! 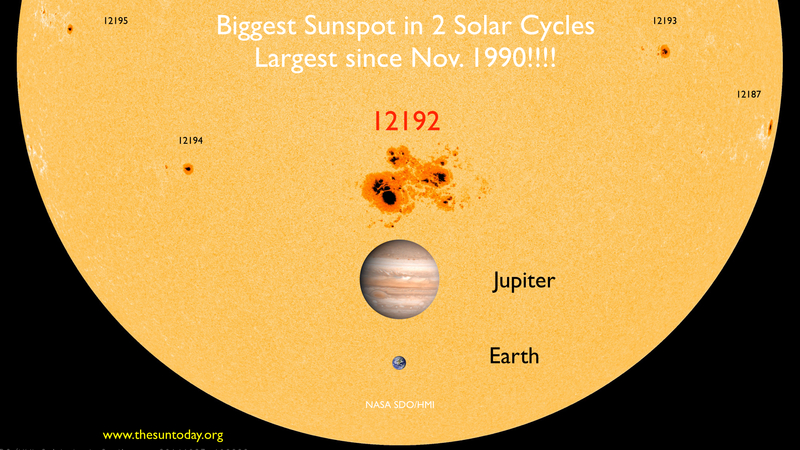 AR12192 is the biggest sunspot in 2 solar cycles and the largest since Nov. 1990. As of October 23, 2014, AR12192 is now the Biggest sunspot in 2 solar cycles. Just yesterday it reached the rank of largest sunspot in cycle 24. The sunspot measures a whopping 2700 microhemispheres (MH or millionths of a visible solar hemisphere). Now it has surpassed AR10486 (2610 MH) of the famous 2003 Halloween storms. It is the largest sunspot since AR6368, which measured 3080 MH on November 18, 1990. AR12192 is the largest in almost 24 years! A reminder for scale, the surface area of Earth is 169 MH. Here is a look at the superspot from the Halloween storms (AR10486) and AR12192 using the SOHO/MDI and SDO/HMI instruments respectively. Astronomer Lou Mayo of NASA Goddard Space Flight Center captured this image of the region despite the wind and clouds of Maryland. An SDO/HMI view of the visible sun showing the largest sunspot of solar cycle 24, AR12192.